The Pulsar 200NS comes with an adjustable nitrox-charged monoshock rear suspension. Although the damping is not adjustable, the spring preload is. At my recent tour to Betong, and because I was riding with a group, I realised that when it came to corners, I seem to hesitate quite a bit more than the other bikes. It could be a case of chicken, or that my Pulsar was the most underpowered bike. But when I was discussing this issue with a fellow biker, he suggested that it could be due to the suspension setup of my motorcycle. 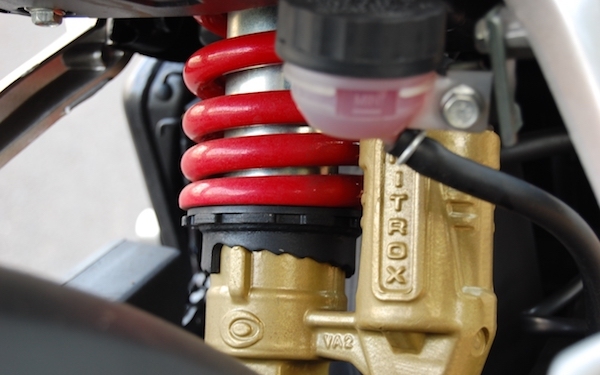 The Pulsar 200NS rear gas-charged mono suspension comes with NINE (9) levels of adjustment settings, with 1 being the softest and 9 being the hardest spring preload. The factory default setting is a very soft level 2. While this may be suitable for most “average sized” solo riders, heavier riders (like me) or riders with pillion and / or luggage should increase the preload for better damping. Level 2 – the default rear shock preload setting on the Pulsar 200NS. I tried borrowing various suspension wrenches from various people, but unfortunately non of them fit the 200NS. So eventually, I headed down to Universal Motors to let the experts there sort it out for me. Apart from locating the tool, it took Ah Tek – the lead mechanic at Universal Motors – literally a mere 5 seconds to make the adjustments. I wanted the preload settings to be somewhere in the middle, and Ah Tek turned it to level 5 of 9 – exactly in the middle. Preload settings level 5 of 9 – perfect for carrying loads (either human or luggage)! Oh what a difference it makes!!! The ride feels soooo much firmer and the bike feels very much more planted, especially when taking corners. But does it now become a harsher ride? No – not really. Yes, admittedly I can now “feel” the road a lot more than the previous softer setting, but going over humps now make a BIG difference! I no longer feel a “series of bounces” after riding through the humps. It now feels like a near perfect damp, with the whole bike ready to take on the road immediately after clearing the hump. I LIKE! Riding over small potholes also feel “better damped” and “firmer” compared to the softer (default) setting which felt somewhat “springy” and “spongy”. Although I’ve not had the chance to go over larger potholes (yet), I’m confident that the firmer setting will take it on without issues. So, if you’re like me – heavy and sometimes carry too much luggage on the rear of the Pulsar, go ahead and try setting the rear suspension a tad bit firmer. You might actually be pleasantly surprised with the difference it makes! Well, at least I was! Most. Bikes are set up for 60 to 70 kg riders. So for us who are a heavier lot. A firmer suspension set up helps. Also the firm rear suspension adds a bit more weight to the front of the bike as the bike is a little taller now. If u have prelaod adjusters on the front give it a go. Else use a thicker oil on the front the next time. It ll make a world of difference to your handling. Hahah! I’m nowhere near 60-70kg – although that’s what my ideal weight should be. Incidentally, I did use a heavier weight oil (15W. Default is a 10W20.) when I performed my fork oil change earlier this year. The next thing I’m thinking of trying is a fork brace. I reckon the skinny front forks on the Pulsar are not engineered to carry weights like what I tend subject it to. Thoughts? I’m not a fan of these fork braces . To me unless you riding on an IDEAL world where there’s no potholes and all the road in the whole world is filled with smooth tarmac then it make sense to use it cos it actually makes sure both sides are of equal motion . Thus at times when we hit a potholes , we already remove the factor to allow the wheel to flex a little by making it compulsory for both forks to move together , it will do more damage to another part of the bike or fixate the direction your bike to go to. The other issue is , it will not let you feel that there’s a leak in your front fork . cos equal motion will = to damage fork transferring the duty more to the other side . which in the end will cause your handling and more damages to the forks than you did not . anyway this has been my theory & my understanding to the funtionality of this brace . Never used them from the very first bike of mine till now 9th bike . never had issue with leaks or fork issues . And i ride off road a lot . even with non dirt bike bikes . Strange. But I would have thought it to be the other way around – if we live in an ideal world with pristine roads, we wouldn’t need the brace. I had the impression that stiffening up the suspension components’ *structure* can only be a good thing. That’s why some bikes come with a built-in brace under the front tire guard. Also, that’s what upside-down forks try to achieve too – a stronger / stiffer structure. Oh well. I could be wrong. I haven’t quite decided if I’d go for it. If you manage to borrow one and try it you will feel the difference . Slight but not a lot . But that slight change really makes the handling a bit awkward . Good Read! Thanks so much for your Inputs! I was of the idea that the rear suspension should be at soft(1 or 2?) for the comfort of pillion rider; isn’t this correct ? Not true. With a pillion, there’s additional weight. 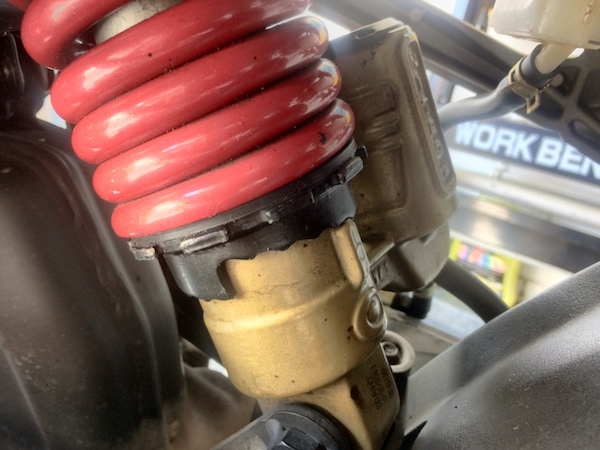 The rear shock will be more compressed, and this will have less travel to absorb any shocks. Thus, you need to INCREASE the pre-load (stiffen or harden) to compensate this.